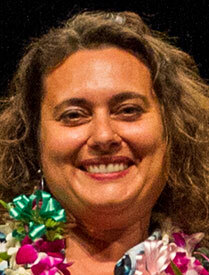 Maria Guerriero is an instructor from the School of Nursing and Dental Hygiene at the University of Hawaii at Manoa. Guerriero believes that teaching must be innovative and combine mind-body-artistic aspects that create vibrant and unique learning experiences. As an instructor in psychiatric mental health nursing, her work with students takes them into settings where they may experience inhibitions and misconceptions. An early adopter of simulation in her clinical courses, and later through the partnership between the school and actors from the Department of Theatre and Dance, Guerriero has created enhanced opportunities for students to function at a higher level of expertise. Through realistic simulations, nursing students are offered opportunities to practice therapeutic communication and care in highly charged emotional contexts.